We are aware of how busy our phone lines are and the difficulties in obtaining an appointment. We thank you all for your understanding and cooperation during this time. It would greatly help the appointment phone line if patients could please call for results and medication queries after 10.00am. Thank you. We continually strive to provide the best possible standards of care and service. In October 2018, Church View Surgery, Hedon Group Practice and South Holderness Medical Practice merged to form Holderness Health. To enable us to work as one organisation, we need to make some changes to our computer systems. This will be done as a phased process between now and the end of May 2019. Please click link below for a leaflet containing all the information you need to know. The Practice was established in 1892, originally extending out to Patrington, but concentrating as the population grew at the surgeries at Hedon and Keyingham. The Hedon surgery started out in a little room in the Market Place, moving to 8 Market Hill and expanding there twice before outgrowing this and finally entering the current premises in 1989. Further extensions have been added to meet the clinical needs of our patient population. Our Keyingham surgery retains its traditional village surgery atmosphere following interior changes. This means when you phone us or call in to the Surgeries to book an appointment our receptionists will be asking you a brief description of your problem. This active signposting by our reception staff provides you with a first point of contact which directs you to the most appropriate source for help. We have gone live with a new online system called Engage Consult. You can use this 24 hours a day and if needed our GPs will respond no later than the end of the next working day. It's simple to use. Patients or carers can choose to ask about a medical problem or send a message about an administration issue. 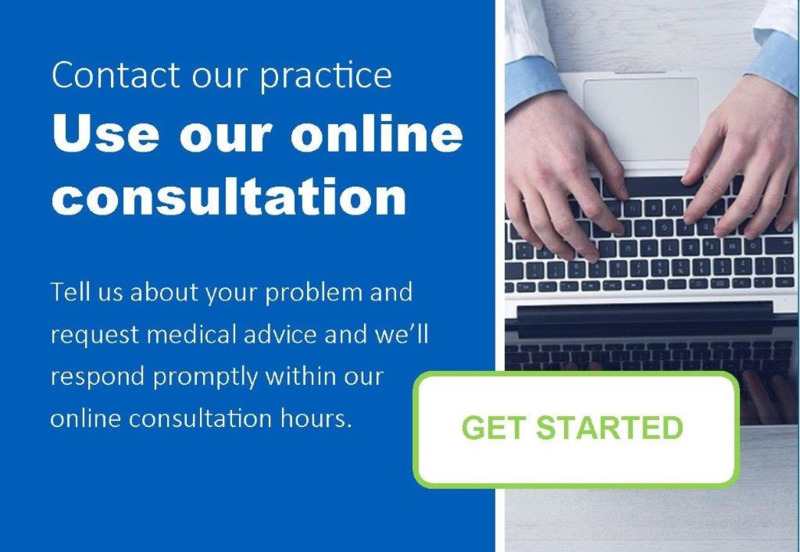 If it's a medical problem you answer a series of simple questions about your symptoms and then a report is sent securely to the practice and used by our GPs to decide the best course of action. Please click on the picture above to get started. We are delighted to announce that Holderness Health has been chosen as the name for the new practice from 1 October 2018. This new practice will now be made up of South Holderness Medical Practice, Hedon Group Practice and ourselves. We three practices currently share responsibility for the care of 36,000 patients in the Holderness area and by joining together we hope to achieve greater benefits for both our patients and staff. By joining together we believe that we will build a more resilient practice that can better look after the needs of Holderness Health patients for many years to come. The GPs would like to discourage patients from waiting outside the front door/gate at Hedon in a morning, especially during the winter months. the surgery front doors until 8.00am. There are different types of appointments available each day and a number of ways to book with a GP. For further details please ask reception for a copy of our ‘Guide to our appointments’ leaflet. Our reception managers now contact patients who do not attend for their appointment. If you feel you do not need the appointment or are unable to attend please contact us so we can offer the appointment to another patient. Thank you. Did you know that we have a Patient Group? The idea of the patient group is to have a representative group of patients we can contact when we have ideas or questions about the future of the Practice. If this is something that is of interest to you please click the link on the right of this page. We also have a suggestion box at our surgery in Hedon. Please feel free to leave your ideas or suggestions there. We are always looking to improve our services to you and are grateful for your input. Thank you. Please take our Friends and Family Test via the link below or on the right task bar. With your permission we display your comments on our patient notice board in our reception area at Hedon. We welcome your feedback to help us develop and improve our services. If you are too unwell to attend the surgery please phone us before 10.00am. The receptionist will request your full name, address, telephone number and brief details about the nature of the problem. This will help us be certain that urgent calls are seen promptly. Every patient at the Practice has been assigned a 'Named Accountable GP'. This is a contractual obligation on the practice from NHS England. If you have not been informed of this already and if you wish to know your allocated GP then simply ask and we will tell you. If you wish to change your Named GP then please contact the surgery. REMEMBER: YOU DO NOT HAVE TO SEE YOUR NAMED GP WHEN YOU COME TO THE PRACTICE. YOU CAN SEE WHOEVER YOU LIKE.